This weekend we had incredible action from Canada, Portugal, Israel, England and Russia. Here are the highlights of the 5 most interesting matches from around the world. In this Major League Soccer action home-side Toronto FC went down to a 2-0 deficit in the first half after some inconsistent football in the first 45. But with half an hour remaining, The Reds changed the momentum and were able to come all the way back for the 3-2 final win. After going 2-0 down before the match clock even hit 10 minutes, home side Estoril would surprisingly come back to tie their meeting with defending champions Benfica at 2-2. But the away side always looked too strong an opposition, with Brazilian forward Lima snatching the 3-2 win with 20 minutes left to play. 3-2 was a popular final score this weekend it seems, as this one woulf finish the same as the first two matches on this list. Hapoel Beer Sheva took on defending champions Maccabi Tel Aviv in league action this weekend and the result was a miraculous one for the home side. The hero of the night was Elyaniv Barda, scoring a hat-trick for Beer Sheva handing them a lead every time. As usual the Merseyside Derby was an intriguing clash between The Reds and The Toffees, and after a scoreless half, none other than captain and Liverpool legend Steven Gerrard would come to his side's rescue, scoring an incredible dipping free-kick goal. 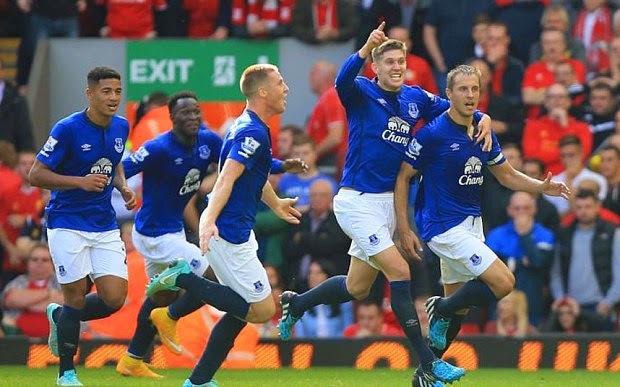 But Everton would not leave Anfield without spoiling the party when Phil Jagielka put his side level on the 90th minute with an impressive shot of his own, into the top right corner. An incredibly entertaining match in the Russian Premier League as bottom feeders Ural took on second place CSKA Moscow. 1-0 was the only time the hosts had a lead in the match, but they did manage to put three past the club from the capital, having the match tied at 2-2 and 3-3. But the visitors proved to be too much on the day, putting the fourth in the back of the hosts net in the 89th minute to secure the 4-3 win.